Go Mama Go Designs Review & #Giveaway: Oh Baby Baby! Registry Event! Oh Baby Baby! I just gave birth to our third child, Baby L. on 11/1 and in honor of her birth, I have teamed up with Buddy Doo's Adventure-Roos & Little Angel on a Mission to feature some of our absolute must-have baby & mama items! Go Mama Go Designs was started by moms armed with a mission to create a safe, cozy sleep environment for infants. We also believe that you don't have to compromise fashion for safety! Wonder Bumpers are the safe, smart alternative to traditional crib bumpers. Beautiful matching accessories and teething guards also available to create the safest, coziest, cutest sleep environment for your baby! I am not a fan of the conventional crib bumper sets. I mean they are absolutely adorable just not safe for baby and I would never use for Baby K. We tried all the alternatives when buying crib bedding. She has a crib sheet and her homemade pillow since she is 14 months now. She really doesn't use blankets because she is hot-natured. We bought her a 4-n-1 crib, the grow with me one. Her is a picture of her in the crib before the bumpers. Notice the arm sticking through? Yeah I can't stand that especially with her being so little. The Wonder Bumpers are very easy to install, took me and B about 30-45 minutes to install because we kept having to chase down Baby K while we were messing with her crib. I chose the purple and latte colored bumpers, Baby K has a Hello Kitty themed room. Blankets, toys, posters and lots more and the purple goes really well with her theme. Here are a few pictures of the crib bumpers being installed and the finished product. I am ecstatic with the final result. They are so soft and warm, she can lay in her crib and just sleep comfortably. 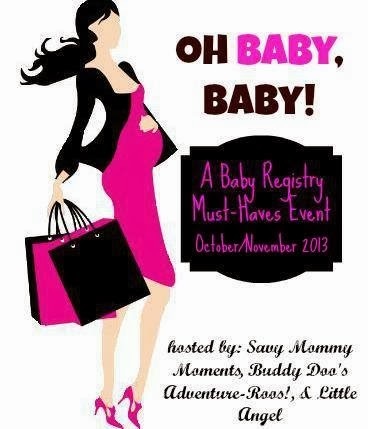 PLUS: If you go to there Facebook page here and like them + leave a comment saying you came from the "Oh Baby Baby Registry Event" You will be entered to win a $25 dollar gift card! There will be ten winners for that! Purchase your very own Wonder Bumpers here. Go Mama Go Designs co-founders, Catherine Hall and Georgia Fiebrich, have created a crib bedding alternative that is not only scientifically proven to be safe but also excluded from all bans on the sale of crib bumpers. We are passionate about crib bumper safety and our mission to educate parents about safe sleep and crib bumper safety. We are very proud to have designed the Wonder Bumpers, a safe bedding alternative and the Snug & Tug, truly a swaddling blanket that works, and provide a better night's sleep and peace of mind for moms and dads everywhere. As mothers, we realize the importance of safety, but understand the desire to design a beautiful nursery. Wonder Bumpers allows parents that option, with a variety of colors, multiple print options and a reversible display feature, the options are limitless. Quality, design and safety are the backbone of our company. These features shine through our transitional, superior nursery products that will provide you and your children safety, comfort and beauty for years to come. Go Mama Go Designs' innovative products include the award-winning Wonder Bumpers, smart vertical crib bumper pads, and the patented Snug & Tug swaddling blanket. Quality, design and safety are the backbone of our company. These features shine through our superior nursery products that will provide you and your children safety, comfort and beauty for years to come. For more information on baby safety, please click here. Disclaimer: If this is a product review, I received a free sample to facilitate my review. No monetary compensation was provided. All opinions are completely my own. My participation is voluntary. I am disclosing in accordance with FTC 16 CFR Part 255. I am disclosing this in accordance with the Federal Trade Commission's 16 CFR Part 255:"Guides Concerning the Use of Endorsements and Testimonials in Advertising." I would choose the Chocolate & Cream set. It would compliment the Lion King bed set perfectly I have in my sons room! I would choose the bluebird set. It would be perfect in my daughter's coral/teal nursery and would be great as a gender neutral option in case our next child is a boy. These are genius and exactly what I've been looking for, as my daughter constantly gets her limbs caught in the slats and I am worried about the safety of traditional bumpers. Free Birds & Chuck E. Cheese Review & #Giveaway! Skinny POP Popcorn #Giveaway!! YUM!